Have you ever wondered what separates the successful home seller from a disappointed home seller? The home selling genius knows what houses are selling for in her neighborhood and how to position her home to encourage multiple offers. The home selling genius know how to tidy up, clean up, patch up, and add the finishing touches to get top dollar. The home selling genius knows how to negotiate a selling price and terms that support her goals. The home selling genius makes moving from one house to the next look easy. The home selling genius works with her agent before, during and after the sale. The home selling genius has an advantage other sellers do not – she works with a ROOST Real Estate Co. Professional. We know how to prepare and position your home in the market so you receive top dollar in the shortest amount of time. More importantly, we’ll help you negotiate a sale that gets you to the closing table on your terms. 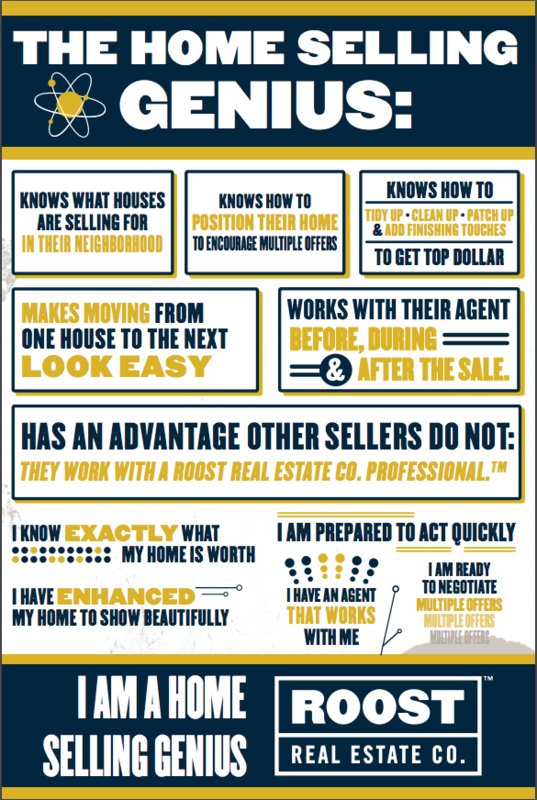 We are ROOST Real Estate Co. We help people just like you become home selling geniuses. Invite us over today and find out how we can help. Are You A Home Selling Genius? Licensed Ohio Real Estate Brokerage.